Nicole Kidman accidentally snubbed Rami Malek on stage at the Golden Globes. 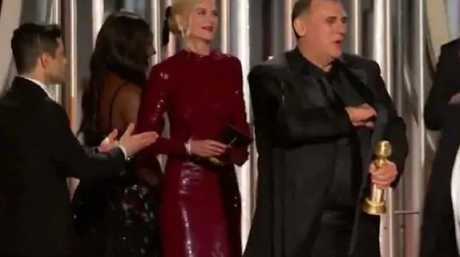 At the Globes, Malek, 37, appeared to try to get Kidman's attention several times and failed miserably. "We're really good friends! I just did not feel his hand on my back," Kidman, 51, told Entertainment Tonight this week. The actreess admitted she was "mortified" that she seemed to snub him and that they were "both in a bit of a daze" when it happened. "I love that man. He's so gentle and softly spoken. He's a darling," she said. "He sent me an email [about the incident]. I sent him an email … we were laughing, actually." Malek tried (unsuccessfully) to get Kidman’s attention several times. Meanwhile, Malek responded to the viral moment on Jimmy Kimmel Live last week. "I had not seen that," the Bohemian Rhapsody star said sheepishly. "I've known her for many years, despite as it may seem from that video! "So, I thought I could easily go up and say, 'Hi,' but in a moment like that … I feel like this is haunting me on the internet right now." The star laughed awkwardly when the video was played by Jimmy Kimmel. 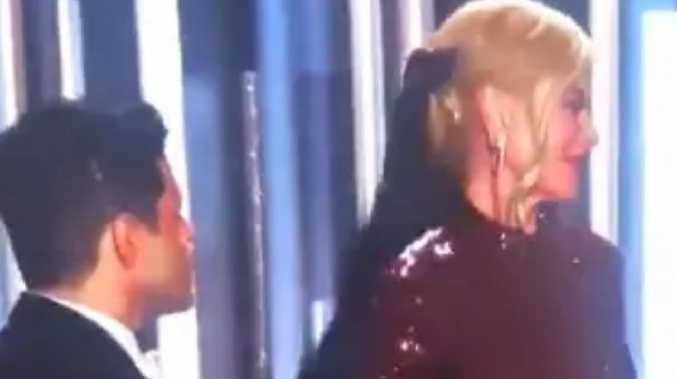 Malek opened up about the incident to Entertainment Tonight on Sunday at the Critics Choice Awards, where he reunited with Kidman on the red carpet. "She's been a friend for a long time, and that's why the whole thing I find absolutely ridiculous and hilarious," he said. "But I'm having a laugh about it all. I got up there, and I was in such a daze I don't even know how I put together a collection of words that sounded coherent. So the fact that I knew Nicole [was there], I was like, 'Oh, here's a bit of safety.' And then she just didn't see me. It was as simple as that."